After a long time, someone has come forward to help the tribals in their area. Just when the candle of hope of the tribals was extinguishing, ISKCON Tribal Care Initiative (ITCI) rekindled it. ITCI believes that the tribal community is a treasure trove of wisdom and there is a lot that we can learn from this community. The tribals are people who live a simple lifestyle in peace and harmony with each other and with nature. Their intimacy with nature, their innocence, their heart devoid of any malice or vices, is the perfect lifestyle that has the potential to teach the world the path one must follow to achieve Krishna consciousness. ITCI thus embarked on a journey to fill the blanks present in the simple and holistic life of the tribals by means of the five cares: spiritual care, health care, emotional care, social care and educational care. Health care, emotional care, social care and educational care are all meant to provide basic needs to the tribals at their doorstep so that they don’t have to migrate to cities for these needs. It can put an end to their struggle for both their identity as well as resources. Spiritual care aims to take the tribals on a journey towards finding their own selves and towards realizing their true identity. Spirituality will not only give them an identity as a tribal community but shall give them a more universal identity wherein they can realize that all human beings are connected and bound to each other by love. Media propaganda makes the tribals feel they are backward although their culture and tradition are very rich. It is an amalgamation of millions of year of wisdom,celebration of life, appreciation of nature and celebration of brotherhood passed down to them generation after generation from their ancestors. In order to make them realize the magnificence of their culture, we need to give them a platform so the entire world can see it displayed in all its grandness.This motive gave birth to the annual Mayapur convention, which is where the tribal customs and tradition come to life. 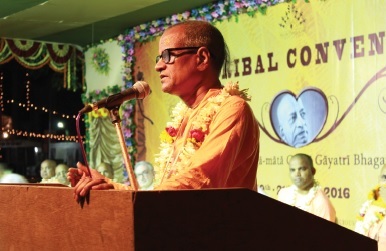 The third annual ISKCON Tribal Care Initiative convention was held from April 19-21, 2016, in Mayapur, West Bengal. Tribes from Assam, Tripura, West Bengal and Odisha (including bhumij, boro, diphu, ge, kalho, karbi, kishan, munda, ho, rabha, reang, santhal, tanty, tea tribe and tripuri) assembled under one roof to interact, appreciate and acknowledge the tribal culture as well as the efforts of ITCI. April 19: Go-puja was performed with continuous bhajanas and kirtanas sung by devotees. His Holiness Jayapataka Swami Maharaja and His Holiness Bhakti Purusottama Swami Maharaja addressed the audience. April 20: The tribals were taken on dhama-darsana where they got to see all the nearby places connected to Lord Caitanya’s pastimes. April 21: The third day was a procession to the Ganga ghata. They performed sixteen upacara-puja, ganga-snan (bathing in the Ganga), tarpana (satisfying the ancestors) and sraddha-asthi-visarjan (immersing the ashes of the forefathers). There were seminars highlighting the importance and significance of these activities and the importance of initiation and Gayatri mantra. 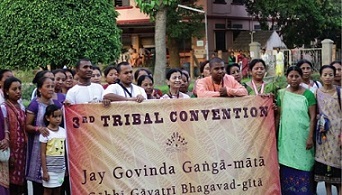 The theme of the convention was “Jaya Govinda Ganga Mata Gavi Gayatri Bhagavad-gita”. Nature and cow worship have been an inseparable part of tribal culture.They believe that they are as much a part of the nature as nature is a part of them.They set perfect examples of how to live on earth without imposing oneself upon her; how to honor Mother Eearth while taking one’s daily needs from her; how to give back to her instead of abusing her. This sense of intimacy with the natural world springs from the fact that the tribals are mostly dependent on forest and forest resources for their livelihood. Thus the convention was a celebration of this age-old tradition which establishes the importance of human relationship to nature, the spirits, other humans, and the self. The convention provided a platform for the tribals to display a rich and colorful array of their folk culture. Folk dance and folk music are the avenues through which tribals celebrate life and express their happiness. ITCI was privileged to share this happiness and be a part of such a rich cultural heritage. 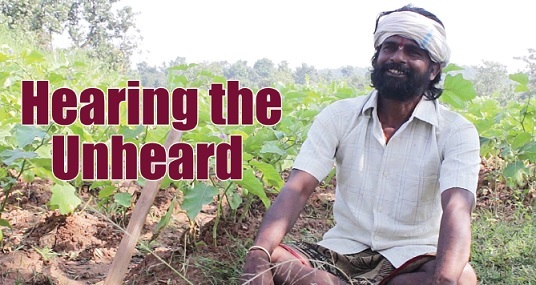 Through its constant efforts ITCI has now become an integral part of the tribal family. A long journey still lies ahead, but ITCI has firmly taken its first step. Ankita Soni is pursuing her graduation in English literature from Ramanujam College of Delhi university.